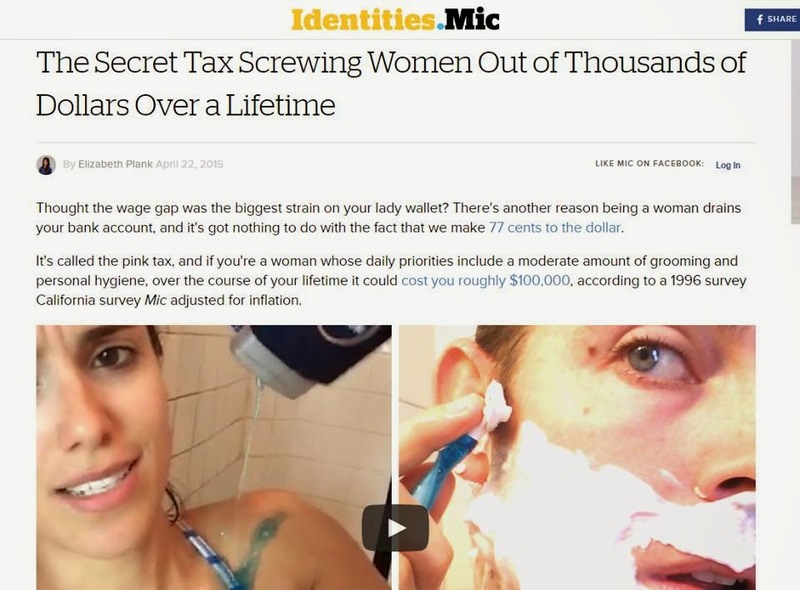 The Chronicle of Cultural Misandry: The Pink Tax Myth: Women Prefer to Pay More In Order to Flaunt Social Status and Sexual Value. The Pink Tax Myth: Women Prefer to Pay More In Order to Flaunt Social Status and Sexual Value. "Thought the wage gap was the biggest strain on your lady wallet? There's another reason being a woman drains your bank account, and it's got nothing to do with the fact that we make 77 cents to the dollar. Companies also charge more because they know that female consumers will buy these products, due in no small part to savvy marketing teaching consumers that certain products are just for women or men, but not both. As a result, women may not consider purchasing a product targeted towards men as an option, even if it costs less." "They may do the same job and be made of the same materials. But the fact that a man’s shirt is a called, well, a shirt, and the woman’s version a blouse, will hit you straight in the pocket. According to a study published in the journal Gender Issues, dry-cleaning women’s shirts costs twice as much as men’s, on average.It means that if a male and female had one set of collars and cuffs dry-cleaned every month for ten years, it would cost a man £162, while a woman would fork out around £310. Beware pink packaging when you’re shopping for personal-care products. It’s often a sign there’ll be a higher price tag.For example, one razor in a four-pack of Gillette Simply Venus 2 disposables for women cost 56p each — 13 pence more than those in the ten-pack of the male version, Gillette Blue II, on boots.com.Gillette spokesman James Williams claims the price difference is there for a reason: men’s and women’s razors have different blades, heads and pivots to perform separate jobs. One razor in a four-pack of Gillette Simply Venus 2 disposables for women costs 56p — 13 pence more than those in the ten-pack of the male version, Gillette Blue II‘The hair women are shaving on their bodies — legs, underarms, bikini line — is very different to those men shave on their face and neck; they are different lengths and have different coarseness and density. Do you always like to smell your best? If so, you’ll be forking out more cash than a man for that, too.A 50ml bottle of Jean Paul Gaultier Eau de Toilette spray for women, which comes in a curvy bottle, will set you back £49 at Tesco. A 75ml bottle of Jean Paul Gaultier Eau de Toilette for men, in the shape of a manly torso, is priced considerably less at £38. Per 100ml, that works out as almost twice as expensive. Perfume expert Peter Sherlock told the Mail: ‘The reason perfumes for women cost more is due to the cost of extracting the scent from flowers. There is also the fact that famous females are more likely to be used to sell scent for women — considerably boosting the marketing spend, says retail analyst Chris Field, who adds that women customers are also more likely to pay for products which they view as ‘reassuringly expensive’. The moment a woman steps onto a garage forecourt, mechanics seem to get pound signs in their eyes.According to one study, a repair job that costs a man about £180 will cost a woman £200. Susan Abbs, one of the UK’s few female garage-owners, says: ‘Women pay more because the moment they step into a repair garage they are in a male-dominated environment and out of their comfort zone. Susan Abbs, one of the UK’s few female garage-owners, says women are in a male-dominated environment at a garage and therefore out of their comfort zone, leading them to be charged more (picture posed by models)‘If a woman calls a plumber out, he’s coming into her space. In a garage, she is right in the middle of the lion’s den. Susan, who set up the Pullman Garage in South London over 30 years ago, says male staff at the bigger car repair chains tend to work on commission. ‘So if they make a woman insecure and worried enough to have all four tyres replaced instead of the two that really need doing, they are more likely to hit targets,’ she says. You may have a gamine pixie style shorter than your husband’s. Yet hairdressers will still charge you considerably more for a cut, just because you’re female.At national salon chain Toni & Guy, for example, men’s hair services are £10 less across the board. At HOB salons, the price gap is even wider. A cut and finish is £50 for female customers, £18 more than the male price. Retail expert Nick Swan, founder of vouchercodespro.co.uk says women are willing to pay more for ‘necessary luxuries’. One may come looking macho in a silver or black can and the other may be decorated with girly flowers and swirly patterns — but there’s likely to be little difference between your partner’s deodorant and yours as far as the active ingredients are concerned. That’s not always reflected in the price, however.One expert study by the University of Florida in the U.S. found that on average a woman’s anti-perspirant costs around 15p per ounce more than a man’s — and the only difference is the scent. As an example of this, Nivea Stress Protect Anti-Perspirant Deodorant — which comes in a feminine white and blue can — costs £1.43 per 100ml. The man’s version of Nivea Stress Protect — in a manly black and blue can — costs £1.32 per 100ml, both on boots.com. Simonne Gnessen, co-author of Sheconomics, points out, however, that women enjoy paying more for some products. She says: ‘A woman’s sense of self is more closely tied to shopping. We associate high price with quality. It’s the “because I am worth it” effect. If you compare briefs for a man and woman, there’s not much difference in price for everyday underwear. But when you consider the amount charged for bras, it quickly becomes clear how expensive it is to be female. Considering that the average British woman has six bras she wears regularly, and most are priced between £16 to £30 at the nation’s biggest underwear seller, Marks & Spencer, that works out at a cost of £138 year. This adds up to a lifetime total of nearly £10,000 from puberty and the first trainer bras, to the end of a woman’s life.Indeed, according to Office for National Statistics data, women spend twice as much as men on underwear every year because they also have to buy tights.And coming in at around £10 a pair, tights are more expensive than socks — and need to be replaced more owing to the fact they ladder more easily. This is one cost a man never has to deal with. Considering that a woman will have up to 500 periods over a lifetime, it’s also an outgoing that can really stack up. According to industry estimates, most women will need at least 11,000 separate items of sanitary protection during her fertile years.As sanitary towels and tampons both cost an average of 13p each, this adds up to an outlay of £1,430 between the start of her periods and the onset of the menopause." Now that we got the fact how women's services and products can be easily explained because of the marketing and how more detailed they are, and not due to sexism, let's investigate what psychologists say about women liking expensive products. This is all assuming that neither 18-year-old was incorporated in his or her family’s insurance policy, which is a much more cost-effective option than going it alone. In any event, insurance companies justify higher rates for young men because the numbers (and the assumptions) say that guys drive more aggressively and get into more accidents than young women. There are exceptions to the 'guys pay more' rule: In a few states, women in the 35- to 50-year-old demographic—who are more likely to have kids distracting them in the car—pay higher car insurance premiums than men of the same age. So we can finally put to rest yet another ridiculous feminist myth, that despite being thoroughly debunked, will probably be spewed frequently by the media, White House and academics- just like their beloved gender wage gap- but we'll be here challenging their claims.